Minna wants to go to school but she has no coat. Her mother and friends make her a coat out of clothing scraps. Minna wears it to school and the kids make fun of her until she tells them the stories behind each of the clothing scraps. 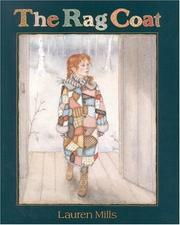 Mills, Lauren, “The rag coat,” Children's Picture Book Database at Miami University, accessed April 20, 2019, https://dlp.lib.miamioh.edu/picturebook/items/show/6012.